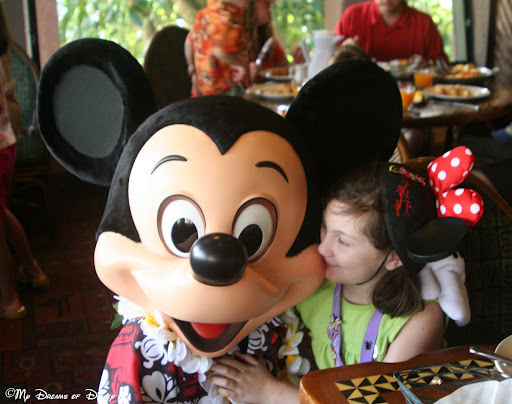 On August 17, 2009, we had a breakfast scheduled at the Polynesian Resort. We had never been to the Poly before, other than passing by on the monorail, so this was a special treat. We were about to enjoy ‘Ohana’s Best Friends Breakfast! We were on the Disney Dining Plan for that trip, and ‘Ohana is a one table service credit restaurant, so since we had never eaten there before, we decided to give it a shot. For us, we knew that Lilo and Stitch were the characters there, but we didn’t do any advance research really, so I don’t think we realized that Mickey and Pluto would also be there! 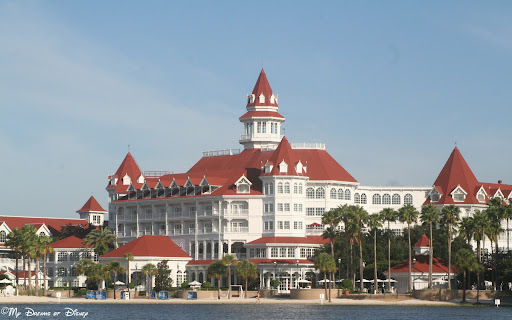 We were staying at Port Orleans French Quarter, so we took the bus to the Magic Kingdom, and then took the water taxi over to the Polynesian Resort. It was such a glorious day, the weather was beautiful, it was a perfect day for a boat ride, and a perfect day to capture some great memories with my camera, as you see here! Taken from the water taxi on our way to the Polynesian Resort. After we arrived, we entered the beautiful lobby of the Polynesian Resort. We’ve never stayed here before, but I have several friends that have, and one day I would love to stay here! The waiting area was crowded, there were several families waiting patiently that August Monday morning for their breakfast time, having a good time, talking, enjoying the wonderful views of the resort, and so on. It was a very peaceful time for me, here I was, on vacation with the family I love, soaking in all of the incredible Disney Magic, just drinking in my surroundings while we waited for our name to be called to head into the restaurant. Sometimes the best things you can encounter at Disney don’t have anything to do with attractions, or shows, or parades, or anything that you would typically think of. Sometimes when you are at Disney, you just need to be, to experience the moment right then and there, and this was one of those times. The ‘Ohana breakfast consists of your standard Disney breakfast; Mickey Waffles, fluffy eggs, great bacon, and all sorts of things like that, but one thing that stands out in my memory was the wonderful sausage. Sadly, I don’t have a picture of it, but it was great! Everything is served family style, so you can get as much of it as you want. I’m getting ready to eat eggs, which I don’t like! At Disney, though, they taste good! Pluto is making his rounds! She also likes Stitch, but she wasn’t sure what to think here! 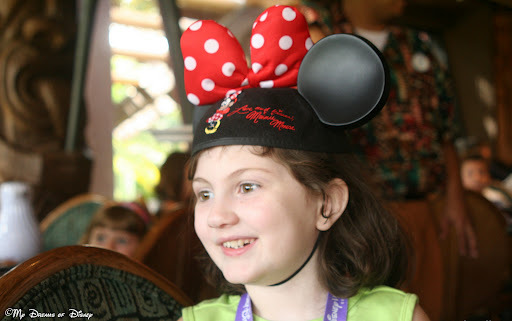 Sophie sporting her Minnie Mouse Ears! Lilo and Sophie sharing a hug! Pluto hogging the camera! You can tell, though, that Sophie doesn’t care! So far, we have only been to ‘Ohana one time. Unfortunately, we don’t have any plans to visit it this year, but I can guarantee that we will be back another time! 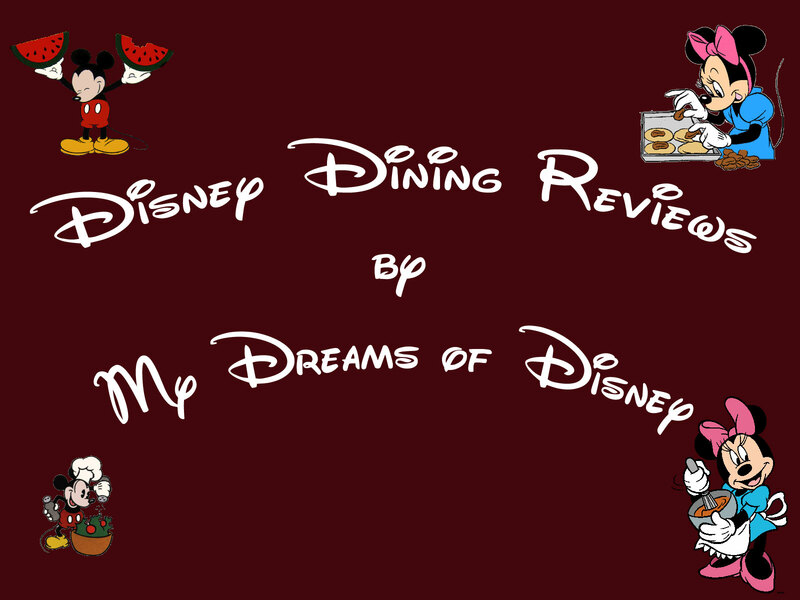 If you are considering whether or not to make this a dining reservation, I strongly urge you to do so! It is a really great meal, but an even better experience! Great review! Oh yum! Love seeing Sophie having fun the characters! We love the Ohana breakfast and I love that you never know quite what Stitch will do! Great review, Mike! I cannot wait to test this one out! Hayley loves Stitch, so it should make for some fun character interactions! Thanks for sharing! Previous Post: RIP Robert Sherman — you will be missed! Next Post: Wordless Wednesday – Disney Flowers and Gardens!